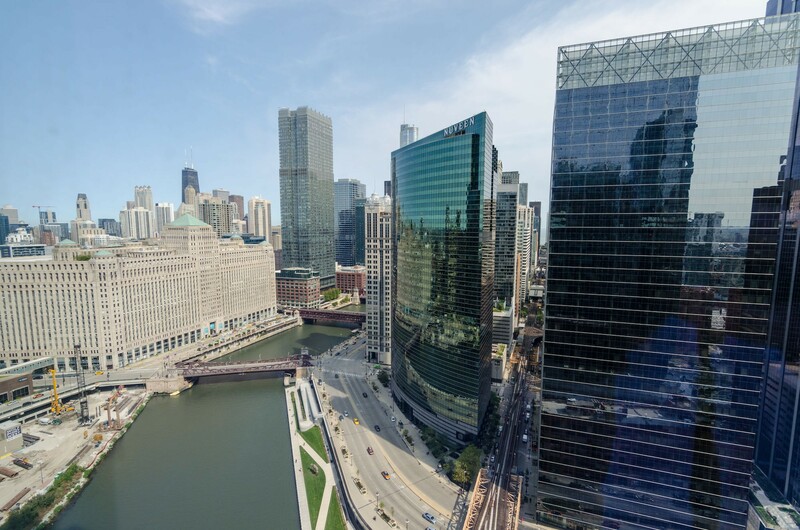 Consistently ranked as one of Chicagoans’ favorite buildings, 333 West Wacker references Chicago in what architect William Pedersen called a "collage of contextual references." The third-floor porthole ventilation covers have become a motif that serves as a signature of KPF designs. 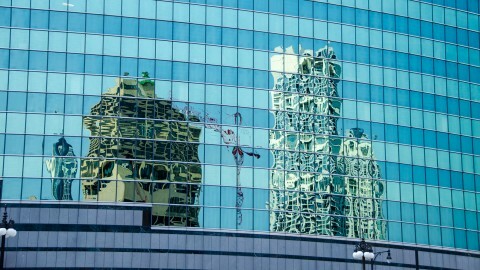 Sound-deadening glass was not available at the time of the building’s construction. To avoid the mechanical equipment sounds from the Lake Street “L”, all usable offices are elevated above the tracks. The building was featured in Ferris Bueller’s Day Off. Ferris’ father works in 333 West Wacker. 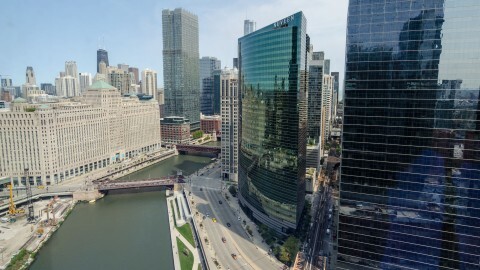 Sited at the point of the Chicago River where the main branch meets its south branch, this 36-floor office building designed by Kohn Pedersen Fox (KPF) stands out among its neighbors. Its 489-foot curved, blue-green glass facade mimics the color of the river. Like a chameleon, it seems to transform as the sun moves across it throughout the day. 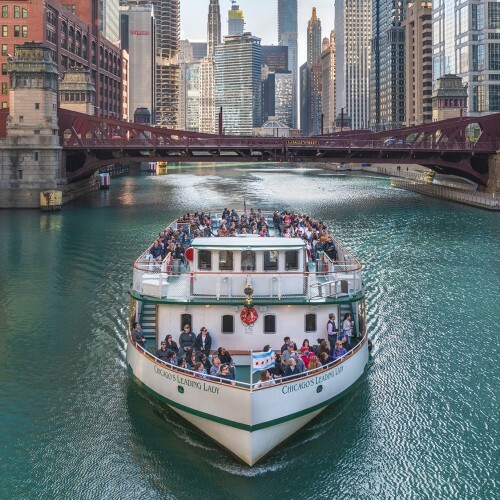 Similar to another Chicago favorite, Millennium Park’s Cloud Gate sculpture, 333 West Wacker’s reflective facade compresses and stretches the skyline to the delight of onlookers. 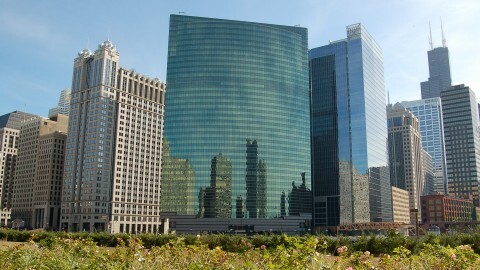 333 W. Wacker is all about its context. Designed for its specific site, it curves with the curve of the river bank. The shades of green in the glass reflect the green of the water below. 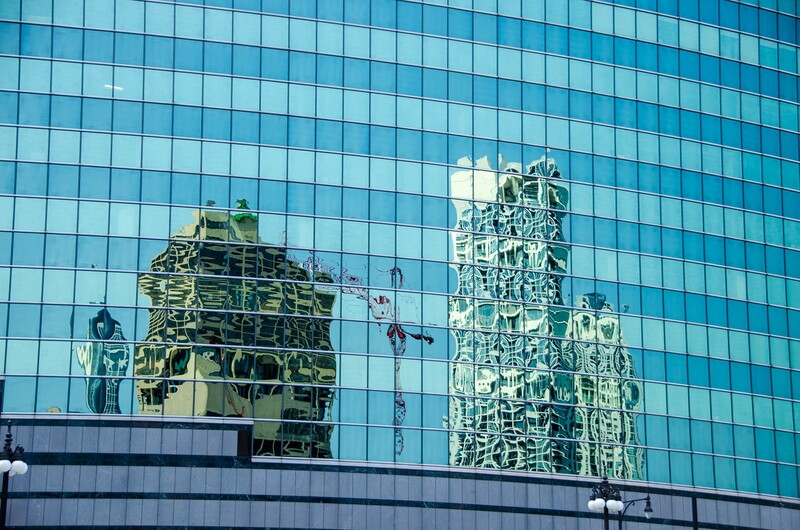 Its glassy wall acts as a mirror for the buildings on the opposite bank. Simple and elegant, 333 W. Wacker is always the same building but its surface changes as the sun and clouds shift and morph throughout the day. 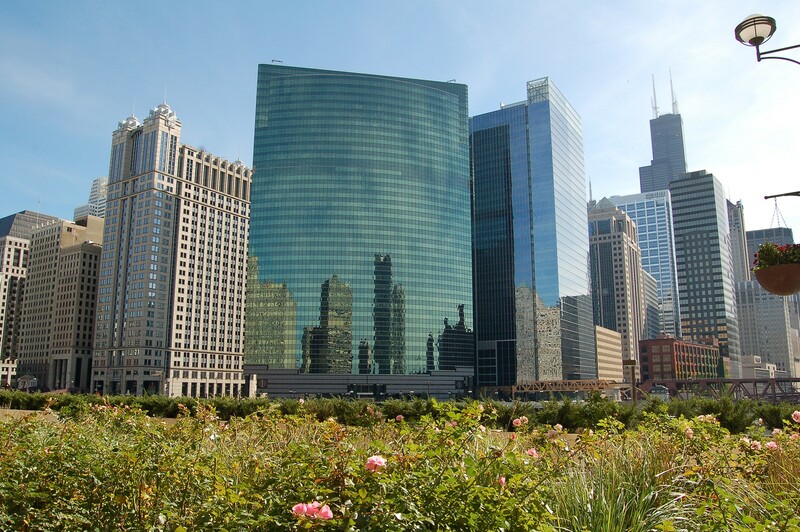 When work began on 333 West Wacker in 1979, much of the surrounding property was bleak and dilapidated. This inspired Pedersen to create a splendid entrance on the Franklin-Lake Street side that echos the city's street grid. Meanwhile, its curved riverside entrance contains richly sheathed octagonal support columns. 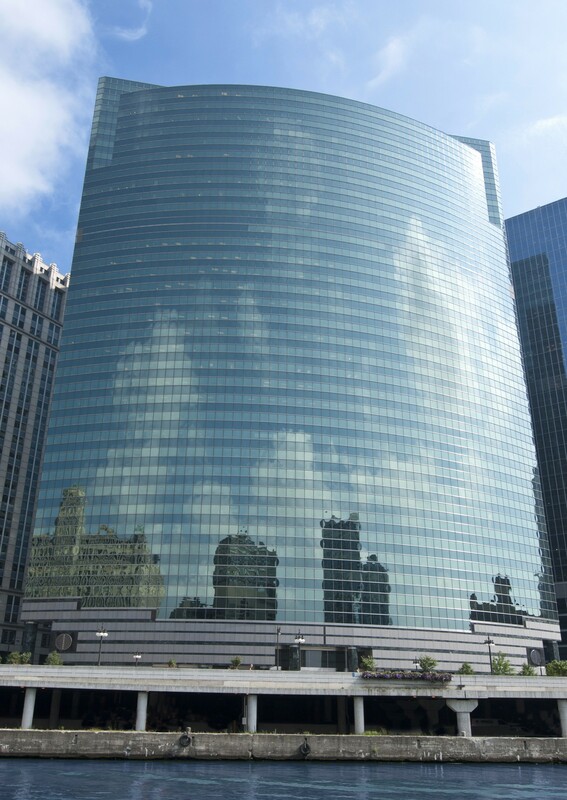 The design of 333 West Wacker echos traditional Chicago commercial buildings of the late 19th century. Its tripartite structure includes a base, shaft and capital. The base serves as the entrance, is composed of stone, and allows the glass facade to appear to “float” above the river. The shaft is a combination of transparent thermal glass windows and double thick, darker, opaque spandrel glass. Brushed stainless steel horizontal banding gives the shaft textural contrast. 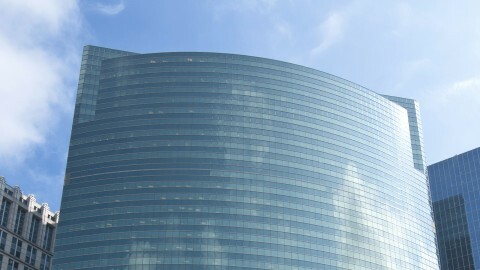 Its capital is a glass curvature with squared sides that intersect in a notched fold, creating a sharp, six-floor arc. Architect William Pedersen never used the term "Postmodern." He preferred “contextualist.” But that contextualism is one reason why some consider this to be Chicago's first Postmodern skyscraper. Whether you argue that 333 West Wacker is “contextualist” or “Postmodern,” there is no arguing it is a beautiful building.